I’m sure you’ve heard the phrase, Flower Power, but did you know there really is power within the flower? The people of the sixties knew what they were talking about. I recently read that having fresh flowers in your home can drastically improve your mood. What we’ve been doing for years, such as bringing flowers to the ones we love and wishing them well, is actually supported by scientific evidence to increase your well-being. There has also been a study in myhousehold that has shown I am 100% less likely to stay upset if I receive flowers (I’m kind ofkidding), but seriously it DOES help. The colors and fragrant petals really do brighten up any room and any mood. With that being said, don’t wait around for someone to bring you a fresh bouquet of Vitamin F(lowers). In fact, I regularly buy myself flowers. I typically buy a bouquet that’s already arranged, but I thought it would be fun to try my hand at flower arranging and create my own. - Prepare everything before getting started. Measure and trim your flowers according to the height of your vase. Fill your vase with water and flower food. Trim the leaves from your flowers. Clean up all your trimmings, so when your arrangement is finished, all of the “work” is taken care of and you can enjoy your masterpiece. - Use tepid water. This is supposed to help closed blooms open up, especially with roses. - Start with a base flower, larger flowers, i.e: sunflowers or hydrangeas and work your way up. Sunflowers are a favorite right now and stay within the fall palette. - Add in three’s. When you begin adding flowers to your vase, add three at a time. I didn’t think this was a super important rule. To be honest I didn’t even plan to follow it, but low and behold, I found that three really is the magic number. - Trim with a knife as opposed to kitchen shears. Too hard and I’m all about sticking to what’s easy. - Use scotch tape to create a grid to keep flowers in place. I didn’t have scotch tape, so I can’t speak truthfully to this exact tip, but I did try to use a plastic wrap…anyways, it didn’t work. I did read that using floral foam is a great way to keep flowers in place and keep them hydrated. Maybe next time but again, I’m always for an easy tip. I think if I were using a very large open vase, the scotch tape trick would work, but the vase I was using had a small opening. Once I got going and added the base flowers, I found they helped keep each other in line. Team work. 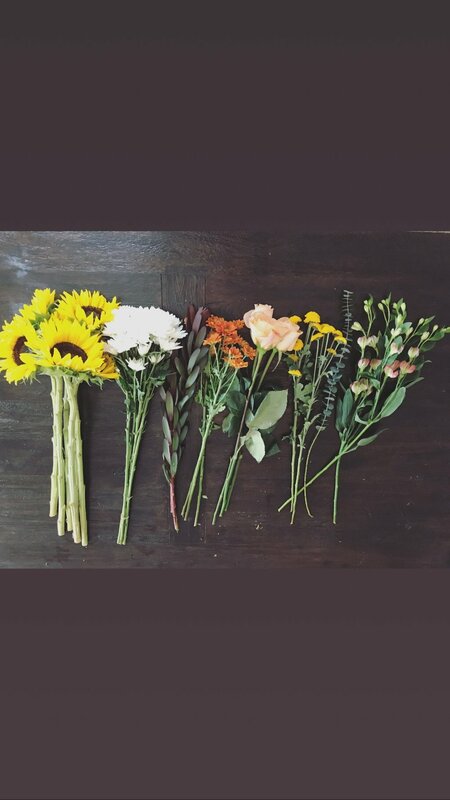 Arrange your flowers, take a break, and then come back. I found several things I wanted to change to achieve the final look. I did this several times and each time gained a new perspective. o A good base flower: Sunflower. I purchased an entire bouquet of sunflowers but really only needed 3-4.
o A bouquet of filler flowers: I went with two different “fillers,” mums and daisies. While they were different colors, their petals are very similar and one or the other would have sufficed. o A WOW flower: My selection was a few peach colored roses. I actually bought the perfect number of roses, three. Again, three is the magic number! o Some fun accent flowers: Golden Buttons. Accent flowers can be used to add a different pop of color or texture. o Lastly, add the greenery: A sprig of eucalyptus and some safari sunsets. To be honest, I had no idea safari sunsets were even a thing, but they have a lovely green and red color that really added so much to my arrangement. In conclusion, go grab some flowers and get busy. Call up your girlfriends, stock up on wine and plan a fun and unique girls night in or just plan some ‘me’ time and treat yourself. You deserve it. Summer to Fall. Wardrobe Transition Edition.